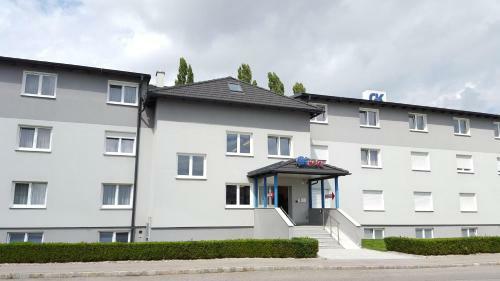 Newly built in 2008, the G&K Hotel is located directly at the B17 federal road in Guntramsdorf, only 15 km south of Vienna between Mödling and Baden. The hotel offers free parking, free internet access and a rich breakfast buffet, which is also included in the price. Business travellers profit from the wide range of single rooms and the modern seminar room. Guntramsdorf?s regional train station is only a few minutes away from the G&K Hotel. The ?Badner Bahn? regional railway takes you quickly and easily to Vienna and the spa town of Baden. Breakfast is served from 06:00 to 09:30 on weekdays, and from 07:00 to 10:00 on weekends and public holidays. Please note that the stated check-in times are only valid from Monday to Thursday. Check-in times on Fridays are from 14:00 to 20:00, and on weekends and public holidays from 14:00 to 15:00 and from 18:00 to 20:00. Newly built in 2008, the G&K Hotel is located directly at the B17 federal road in Guntramsdorf, only 15 km south of Vienna between Mödling and Baden. GK Beach Hotel, formerly known as Galazio Kima, is a delightful beachside hotel located in Kalives, Crete and is exclusively available to Simpson Travel.